It has been a while since I last visited Brighton vegetarian Food For Friends, but it's had a glitzy new face lift and a menu shake up so a revisit was due. The lick of paint has been a success, the soft greys and golds make for a rather beautiful, smart and modern space to dine in. Every time I visit I try the tofu. I'm almost desperate to discover the draw of this substance. 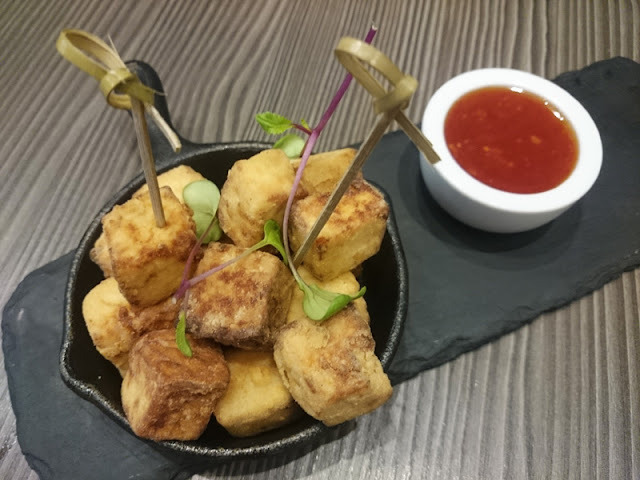 This time I ordered the recommended crispy tofu which surprisingly arrived spongy and soft. Unfortunately it still delivered on the tofu promise. With more invention in plant based dining I am even more puzzled as to why people still eat this stuff. Much better was the daily soup. 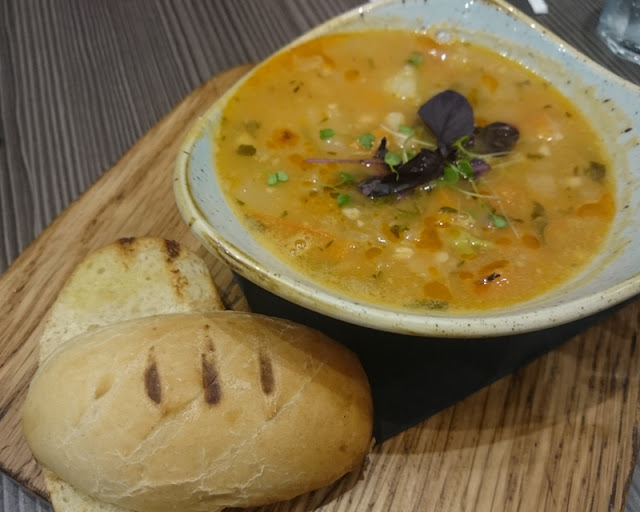 A comforting country style bean soup, with chunky vegetables and plenty of herbs and interest. It came with a nice little brioche bun too. 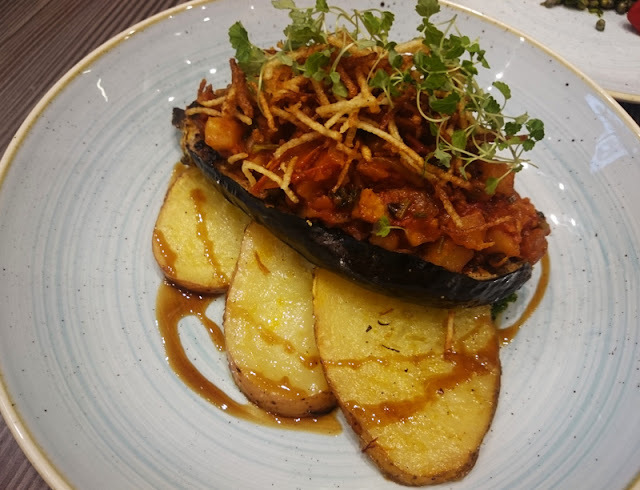 Impressive was my main, a tahini marinated, silky roast aubergine, topped with chipotle pepper and tomato ragout. I loved this and was packed with flavour and texture. There was a good spice heat in addition to smoky chipotle undertones and a sweetness from a drizzle of pomegranate molasses. The slices of saffron potatoes made the dish a substantial feed, a good thing in my book. Delicious to the last forkful. My friend ordered the piquillo peppers which was a beautifully presented plate of food, like a line of Italian cornicelli. 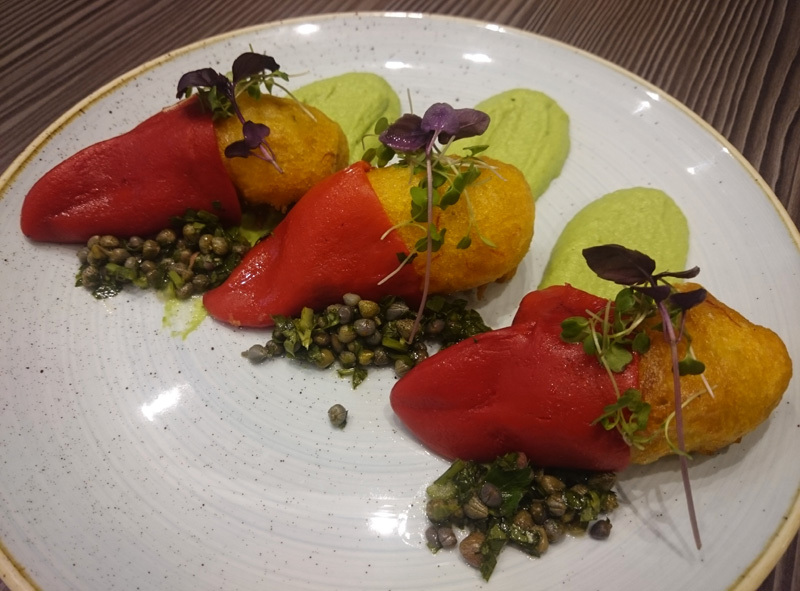 The vibrant streaks of wasabi pea purée had the perfect amount of heat. The rice balls, I suppose a battered version of arancini, lacked a little flavour, but overall it was enjoyable enough. All in all it was a nice meal but at every visit I always feel there's a missing ingredient with FFF's food. Don't get me wrong everything is nice; nice presentation, nice decor, nice location, nice menu design...but it just off the mark to make it particularly stand out. 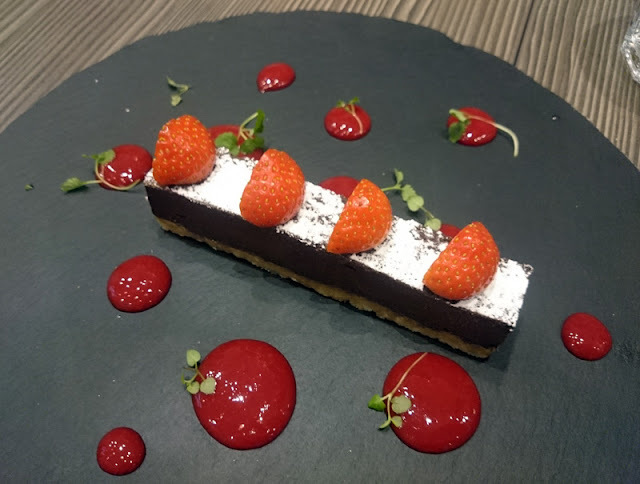 Although you will generally always enjoy your meal here, aside from the odd dish that is a real win, mostly there is something that falls short of perfection on each plate. 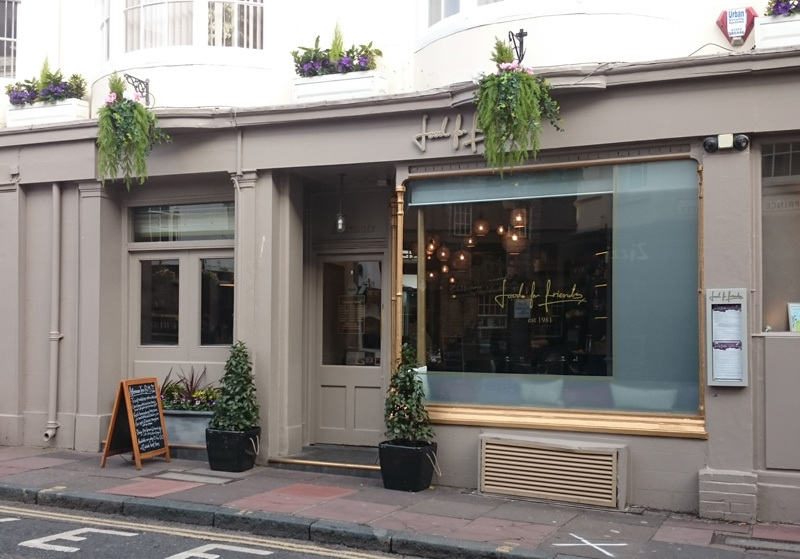 Food For Friends is one of the longest standing restaurants in Brighton which is to be respected, but with the local food scene getting stronger month by month, particularly for plant based dining, it really needs to up its game. Nice just doesn't cut the mustard today. The only real negative of our visit was the aggressive, frosty welcome which actually inspired the couple behind us to leave the restaurant open mouthed after being ordered around quite brusquely. Luckily another member of staff rescued the day for us (as well as our botched booking) but in all honesty, I had one foot outside the door as well. Had I not been in for review I would have left too. Service really is as important as the food and can leave a bad taste in your mouth for the rest of the meal. However, after being seated we were looked after very well for the duration of our visit by the nicer staff member (who was, it has to be said, a delight). As I said, plant based dining has been embraced by a wider audience than just the vegetarian community. Many meat eaters (myself included) are choosing more sustainable and healthier options and with new openings like Rootcandi and even non-vegetarian restaurants like Silo and 64 degrees offering stunning meat-free options, there are new friends to make out there.